Charities often sit atop a mountain of data. Imagine what we could achieve if social organisations were willing and able to share data with each other to uncover new patterns and insights into complex social problems. Well, that is exactly what happened at DataKind UK’s Autumn DataDive. St Mungo’s Broadway, a charity that helps people recover from the issues that lead to homelessness, linked up their data with data from Citizens Advice, a national charity that provides free advice and information on civil matters to the public. St Mungo’s Broadway wanted to look at what kinds of issues people went to Citizens Advice for help with before they ended up homeless in St Mungo’s Broadway’s system. St Mungo’s Broadway holds a large amount of data on people who are either homeless or living in their hostels. However, they hold relatively little data about these individuals before they became homeless. By matching up the datasets, they sought to highlight the problems experienced before people became homeless and get a more complete picture of people’s journey into, and experiences of, homelessness in a way that has never been possible before. What sorts of advice do people seek before they become homeless? How do St Mungo’s Broadway’s services perform for different groups of people? What happens to people when they leave St Mungo’s Broadway’s services? The first step was to make sure that there was indeed an overlap of clients in the two data sets. St Mungo’s Broadway and Citizens Advice found 1,500 individuals who appeared in both organisational databases. Staff at the charities extracted the relevant data and anonymised it. The three DataKind UK Data Ambassadors, Ndidi Uka, Amit Bhagat and Roberto Vitillo, then helped St Mungo’s Broadway prepare for the event. They cleaned the data, made sure that there was an equally sized dataset of clients who had not been to a Citizens Advice Bureau to use for comparative purposes and helped St Mungo’s Broadway define the questions that could be answered with the data. The team of 30 volunteers worked together over the course of the weekend to find that St Mungo’s Broadway clients are more likely to approach Citizens Advice for help with immigration and housing requests. A separate analysis of the data produced one of the most interesting findings to come out of the weekend - St Mungo’s Broadway’s clients were more likely to have approached Citizens Advice for help with employment support allowance, compared to other Citizens Advice clients. Employment support allowance is a government benefit paid to those who suffer from an illness or disability. 18% of St Mungo’s Broadway clients visiting Citizens Advice sought help with this allowanceand, among those, a third were specifically interested in appeals. Employment support allowance issues are 10% more prevalent amongst the homeless community than the general Citizens Advice client base. The data science volunteers began tackling some rather ambitious project ideas. For example, they tried to identify characteristics of individuals who are more likely to have a positive outcome after taking part in St Mungo’s Broadway’s services. 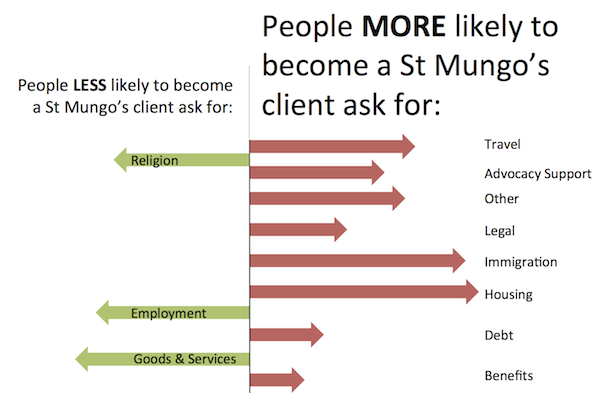 Other volunteers created a predictive model to establish how likely it is that a client will return to St Mungo’s Broadway for help and, if so, which type of service they are likely to require. 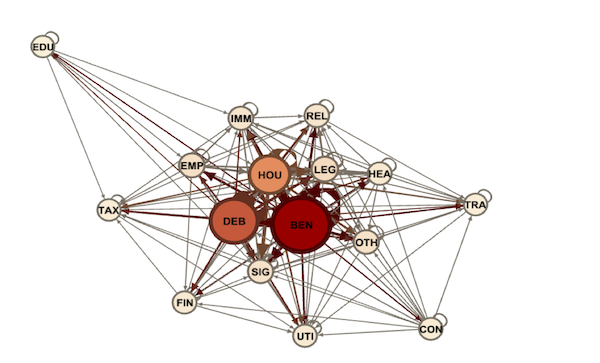 Work was also done in Gephi, an open-source visualization software, to analyse the paths and the co-occurrence of issues for which St Mungo’s Broadway clients sought help from Citizens Advice. St Mungo’s Broadway were blown away by the variety and ingenuity of all the analyses done at the DataDive. "It opened our eyes to what is possible. We are full of ideas of what to do in the future,” said Dan Dumoulin, Senior Policy and Research Officer at St Mungo's Broadway. St Mungo’s Broadway is in talks with Citizens Advice about a possible research project that would build on the work started at the DataDive. They want to further identify the problems that homeless people approach Citizens Advice for help with and dig into how this compares to the non-homeless population. St Mungo’s Broadway and Citizens Advice have become data pioneers and are showing the kind of impact you can have when you link data across organisations and use your imagination.